Many thanks to Jo and Virginia for testing this pattern. Round 6 edited 8/3/09, edits in red. 3. All sizes are made with the same pattern. The different yarns and hook sizes make it the different sizes. Yarns I used in developing this pattern: Woman’s Red Heart - Super Saver, Tween/Teen’s - Simply Soft, and Child’s - Red Heart Sport. Made one with Lion Brand Baby Soft and it would fit 0-6 months. Thanks for the pattern. This will make a lovely gift for my nephew's girlfriend. He calls her butterfly. You do such wonderful work. Thanks for sharing. This hat is soooooo cute! I am going to make one tonight! For my 6 mos old daughter. Thank you, I will try to send a picture when I am all done! What a sweet cap! I worked it up in my spare time today. I was quick and easy to follow your instructions. Thanks!!! I will be giving it as part of a shower gift. I loved reading your kind comments. Would like to see photos. I'm happy to come across your blog. Thank you for every pattern. Soooo cute im giving it to my 3 year old cousin for Christmas! it only took me about an hour! im thinking of putting a flower on it thanks soo much! in round 6 what does tr mean? Thanks for the pattern, My 18 month old daughter will love it. I love this pattern. I worked it up in about 2 hours, and my two daughters fought over it! So now I have to make another one!! Thanks for the great pattern. In row 8 you say "dc in next 9 dc." I'm assuming you meant "dc in next 9 sc" since the previous row was done in sc. I just thought I'd point that out. this hat is too sweet! I am making it for my daughter and nieces!! They will love it!! 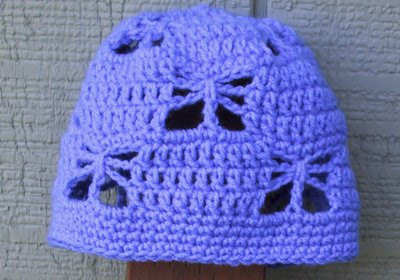 This hat is so cute, but I just can't seem to get it to turn out right... it is very bunched up & lumpy. The butterfly stiches are perfect, but the spaces inbetween is where it gets lumpy. Any thoughts on what Im doing wrong? Sometimes a cap just needs a head to look right. Yes the tr is treble. Great hat. It would be nice to have a video tutorial, since others want to learn, but aren't that great with "crocheting terms". My daughters would love to learn... I just have enough time to walk them through it. Sorry, I don't do video. Hi do you have a way to turn this into a scarf? My mom loves butterflies and I would love to make a matching set for her. Thank-you! At the top you will see you need to copy into your choice of program to print. Myself I use MS Word. Tried using this to make a cap for my mother-in-law. Didn't fit. How can I make this bigger for her head? You could use one of the heavier worsted weight (4) yarns like Caron One Pound. Then use an I (5.5 mm) hook. Another thing you can work an extra round of double crochet before doing the sc. I just finished this. It looks awesome. Thanks so much!